Official Organ of The Institute of Mentalphysics, which spreads the Inner Teaching of International Church of the Holy Trinity, to enlighten those who seek the understanding of Divine Law and who wish to assist in spreading the Light of Divine Wisdom--to help in the Regeneration of the Human Race, and to make this earth a veritable heaven, populated by the New Race in the New Age. Los Angeles, CA. Publisher: Published under the auspices of the Publications Committee of the Institute of Mentalphysics, for general distribution among the Student-Body. Editor: Edwin John Dingle, F.R.G.S. ("Ding Le Mei"). Dingle (1881-1972) was an expatriate Briton who, after the usual claimed instruction in Tibet, ended up in Los Angeles, teaching vegetarianism, pranayama, and Tibetan mysticism. Unlike many contemporaries, he had, at least, spent time in the East (as a journalist). In the 1920s he spent time, supposedly "in retreat" in California and then in 1927 began teaching what he had learned under the name "Mentalphysics." He founded the International Church of the Holy Trinity, an imposing church in Los Angeles, replete with an elaborate hierarchy of Senior Beacons, Noble Custodians, Noble Recorders, Noble Keepers of the Portal, and the like, and widely sold his lessons through an Institute of Mentalphysics. This offered a series of practical lessons for developing extrasensory perception and elevated consciousness. "Mentalphysics is the key which unlocks the door to the hidden meaning of the Bible and all Holy Books, It is, in fact, the Gospel of the New Age -- a power in the hands of those who faithfully follow its principles which lead to self-mastery, the realization of our highest capabilities, and their actual demonstration in physical vitality, prolonged youth, intensified talents, superior intelligence, growth of character, nobler and more abundant lives. Happiness, joy, peace, harmony and the victorious accomplishment of our worthy aspirations, all reside in the power to which Mentalphysics is the guide. The practices taught have been found by hundreds to be revolutionizing in their effect. A method is taught, rather than a creed, a method which has been used by wise men for thousands of years to avail themselves of powers little known to the multitude, to approach greater knowledge of the immensity of man's true capabilities." 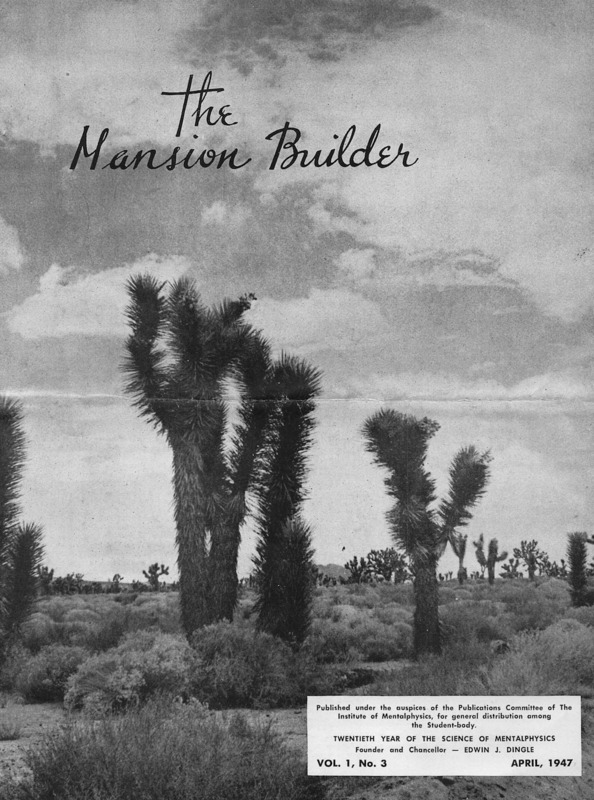 At the beginning of World War Two, Dingle and his disciples began to develop a "New City of Mentalphysics" in Joshua Tree, California, with buildings designed by Frank Lloyd Wright, and the journal seems to have been intended to promote the new community and contained messages of encouragement and uplift by Dingle. UCLA.